The Smith Tower as seen from the Russell Investments Center building in downtown Seattle Wednesday November 11, 2015. Smith Tower, renovated in 2016, is a storied piece of the city’s history. Here’s a timeline of the rise, fall and rebirth of the Seattle landmark. Once the tallest building west of the Mississippi River, Smith Tower likely has claim to the title of Seattle’s boldest building project. Dreamed up by Syracuse typewriter and firearm magnate L.C. Smith, the building, constructed in 1914, still cuts a striking figure on Seattle’s skyline. From its conception in 1909 to a renovation that wrapped up in 2016, take a look (via Seattle Times archives) at this storied piece of the city’s history. 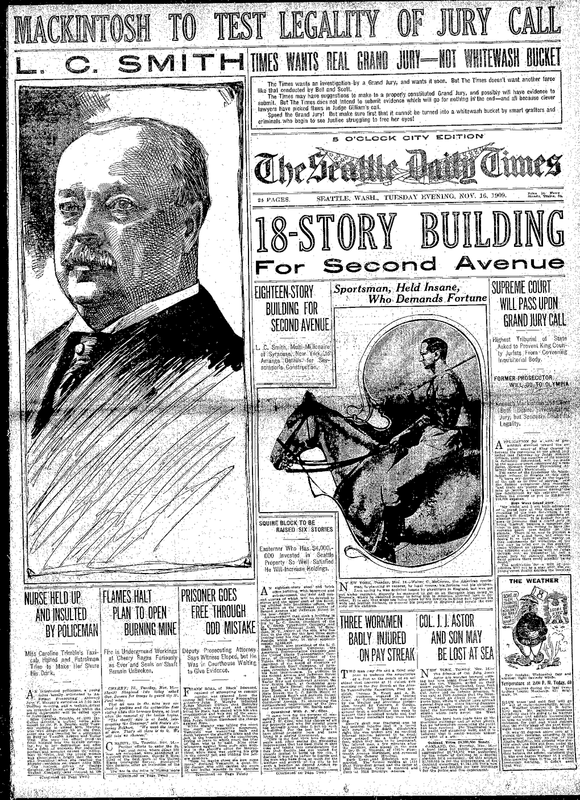 November 1909: Smith, who made his fortune in the typewriter business, told The Seattle Daily Times (as The Seattle Times was then known) he planned to construct an 18-story building on Second Avenue. 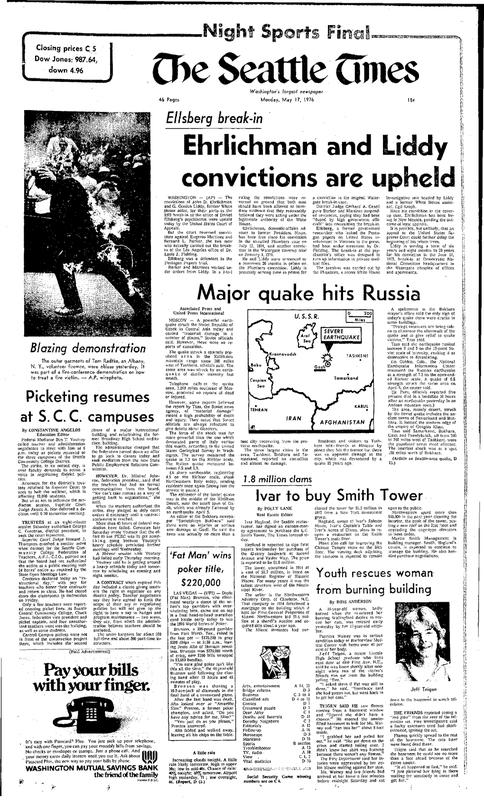 Smith had purchased real estate in Seattle years before, but hadn’t undertaken large projects in the city. “I decided it would be unfair to Seattle and the welfare and growth of the city to let such a location on Second Avenue remain unimproved any longer,” he told The Times. Smith, who died a year later, left the project to his son, who went on to build a more ambitious 42-story tower. 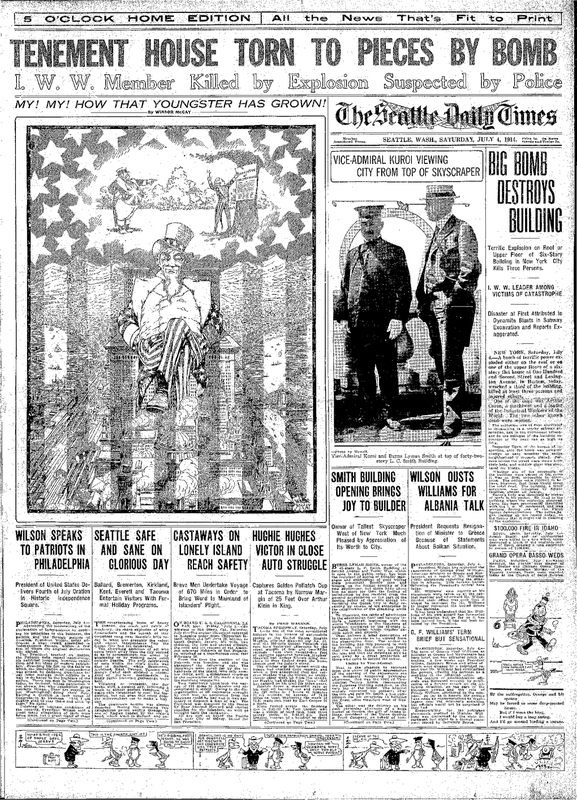 September 1912: With building permits in hand after much consternation and construction well under way, critics who believed the project a publicity stunt were silenced. “It marks the entrance of Seattle into the ranks of the larger metropolises of the world and places it second rank of all as far as skyscrapers are concerned,” wrote a reporter for The Times. July 1914: The L.C. Smith Building opened on the Fourth of July, to much public appreciation. Smith gave a tour of the building to a visiting Japanese admiral. February 1929: The L.C. 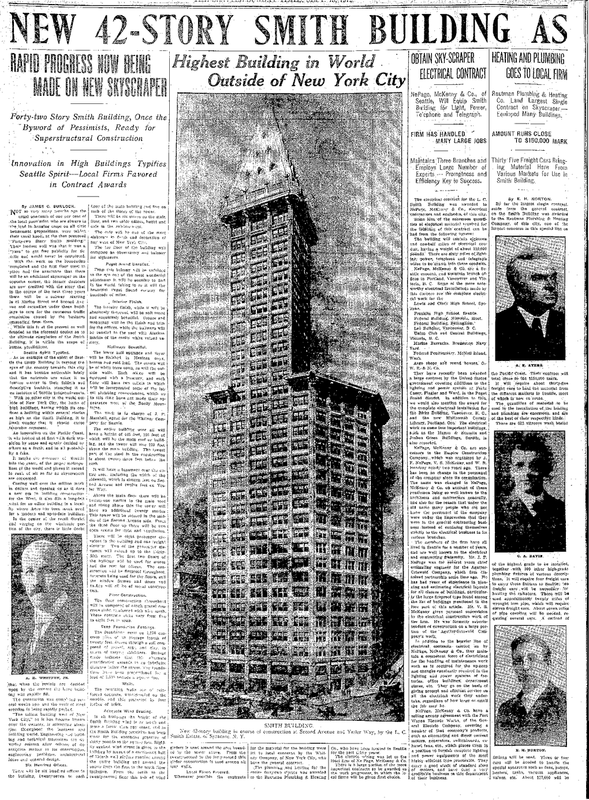 Smith Building was renamed Smith Tower “for the sake of brevity,” The Times reports. 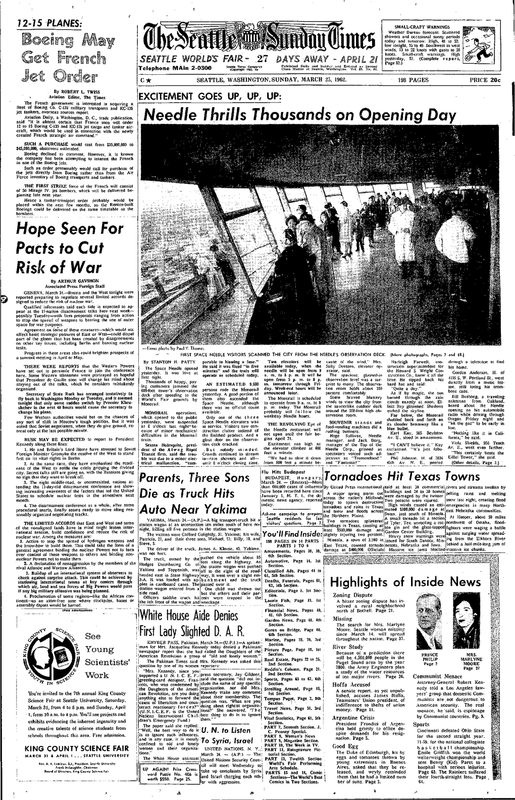 March 1962: “The Space Needle opened yesterday. It was love at first sight,” wrote a Times reporter on March 25. The needle rose more than 100 feet higher than Smith Tower, meaning the 1914 Tower had lost its place as the West Coast’s tallest structure. 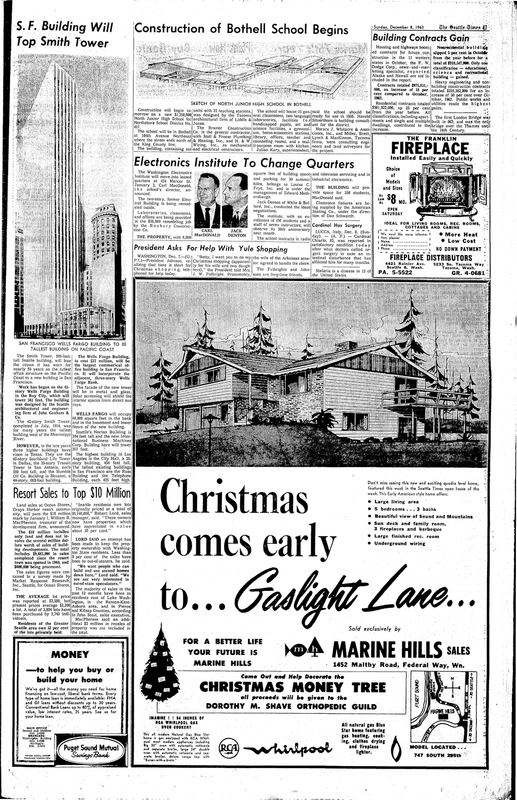 December 1963: In San Francisco, work begins on the Wells Fargo Building. “The Smith Tower, 500-foot-tall building, will lose the crown it has worn nearly 50 years as the tallest office structure on the Pacific Coast to a new building in San Francisco,” the Times reported. May 1976: Although the property had changed hands several times, it hadn’t ever had a celebrity owner. 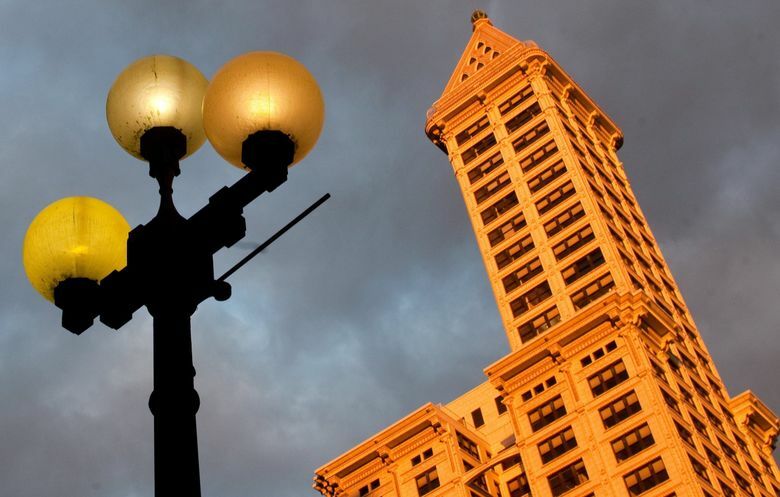 For 1.8 million clams, Ivar Haglund, local character and famous restaurateur, purchased Smith Tower. Haglund planned to upgrade the famously lavish Chinese Temple room, known for its extravagance. Haglund made changes to the building’s exterior and flew a 16-foot rainbow salmon windsock on the building for the decade he owned it. 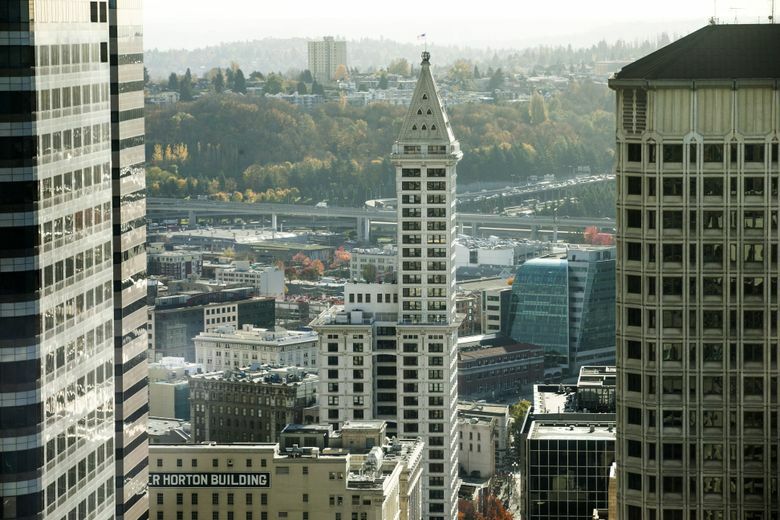 March 2012: For years, Smith Tower changed hands in real estate deals. The tower hit a low in 2012, though, when the skyscraper was sold at a foreclosure auction. The building was about 80 percent vacant, and losing money. June 2016: Unico Properties purchased the tower in January 2015. In June of the following year, it announced plans to reopen Smith Tower’s famous 35th floor and add a speakeasy.